This Photon Light technology represents over 25 years of research and development in the field of BioPhontics, and Photon Therapy. I believe this system will enhance and improve your life in Body, Mind, and Spirit. US FDA Disclaimer: The products and the claims made about specific products on or through this program have not been evaluated by the United States Food and Drug Administration and are not approved to diagnose, treat, cure or prevent disease. The information provided on this site is for informational purposes only and is not intended as a substitute for advice from your physician or other health care professional or any information contained on or in any product label or packaging. You should not use the information on this site for diagnosis or treatment of any health problem or for prescription of any medication or other treatment. The missing link is Photon Energy from the proper light source for your biology. Scientifically, light is a nutrient to the human body. It is like food for your biology. Humans photosynthesize light into energy just as plants do. Albert Einstein received the Nobel Prize for this incredible discovery. The Spa system is based on the latest state of the art research from around the world in the well established fields of Biophotonics, Bioenergetics, Brainwave Stress Management, Anti-Aging and Holistic Wellness. The science of biophotonics is so well researched and internationally praised that many people have heard of or have experienced a photon session themselves. Created to help you have more personal control over improving your quality of life, the Pure Light Spa Photon Energy System, is designed to profoundly improve your quantum health – the deepest core of your biology. Just as plants need sunlight to thrive, the human body needs light to maintain health and well-being. Human cells are activated by particular wavelengths of light called photons, which are absorbed through the skin and into tissues. At the cellular level, the photons are transformed into life-force energy that stimulates the growth, repair and regeneration of the human body. This is the science behind light therapy. 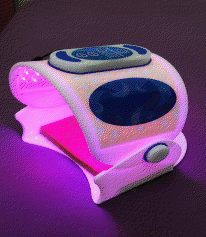 Light therapy devices, which employ Light Emitting Diodes (LEDs), promote this biological effect, creating the most natural form of anti-aging. At Pure Light Therapies we use LEDs and a unique patented program that stimulates a series of biological responses at the cellular level, causing the body to release healing enzymes that increase cellular metabolism and the production of ATP, the energy currency of the body. By activating the body’s own healing system, LEDs provide a gentle, safe and affordable solution for the visible signs of aging and other degenerative issues of the body. Unlike lasers, which deliver enough power to actually damage the tissue in order to stimulate healing, LEDs are completely non-invasive. After more than 30 years of research not a single negative side effect has been documented. LEDs have been used successfully for years by dermatologist’s offices to treat skin problems, by sport medicine clinics to treat injuries, by wellness centers for pain relief and cancer hospitals to speed healing from invasive treatments. 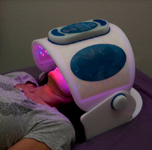 At Pure Light Therapies we offer the most advanced photon therapy technology available -the system treats the skin to blue, yellow and red light simultaneously, combining photo rejuvenation, sleep enhancement, energy renewal and Brainwave Therapy in a unique and patented process. Each program provides the equivalent of a full night’s restful sleep and energy renewal. A unique brainwave entrainment system allows the client to experience a meditative state of deep calm, creativity and focus. During each 30 minute session brainwaves are gently lowered from 15-14 cycles Beta, a wakeful, busy state through 10-12 cycles Alpha, promoting calm and soothing relaxation. At 10-20 minutes brainwaves move into 8 cycles Theta, at which point the brain begins to deeply rest, improving mental clarity and providing profound stress relief. Physical stress relief (like over exercising) etc. In the first session, the lights may seem overly bright, this is an illusion, it will not hurt your eyes and will settle down as you get used to it. The lights will seem to make movies, geometric patterns or mandalas in your mind, this may change as the session progresses and the effects will be different in each of the three programs that have BrainWave Entrancement. Most people really enjoy this additional effect. You can always turn this effect off by pressing the TRANCE button. You may see many different colors during your session. This is because the cones and rods in your eyes are unique to your eyes. Occasionally some people may see a green tint in their vision right after a session. This is because green is a complementary color to your eyes red receptors. This is natural, non-harmful and will fade away very soon after a session. For some people it may take two or three sessions to realize the full effects and benefits. Especially in the first session because your mind is curious, thinking too much and wondering what to expect. Once your mind has become comfortable or feels safe, you will go to a much deeper and enjoyable level with each successive session. At about the 3rd to 5th session you may feel and be at an energy level you may not have experienced in this life. This is because your body was born out of your mother’s body and she could only give you what energy she had to give you. The energy you are born with is called your ‘body organ reserve’ or ‘body energy reserve’. This body energy reserve tends to be depleted by the time you turn 30 to 40 years old. The Spa helps you to replenish your energy and “charge your battery”. This is a health maintenance technology. The energy you receive from the Spa is cumulative. The more consistently you recharge you body the more you can get from it. You will begin to regenerate more than you are degenerating. This is true anti-aging. Having low energy is very stressful to your body, mind and mood, so as you recharge your energy, the stress goes down, your mind clears up and your mood lightens. Sessions last 30 minutes and it is recommended that you rest for an additional 15 minutes before getting off the table to allow your body to adjust to the new energies.